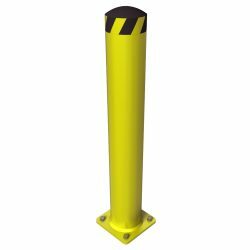 Structural Bollards are a simple but effective way to protect staff and infrastructure at industrial facilities, particularly those that involve forklift traffic. BHS offers Structural Bollards in several standard sizes, but also customizes them to meet unique specifications. BHS Structural Bollards are made of welded steel to stop lift trucks in their tracks before they collide with valuable equipment and racking. These guard structures also have an OSHA-yellow powder-coat finish for optimal visibility. These surface-mounted bollards have an 8-inch by 8-inch base plate with four mounting holes and anchors. Contact our sales team at +1 314 423 2075 to find out more about bollards and other structural barriers from BHS. Email your own specifications to [email protected] to start designing a customized set of Structural Bollards.